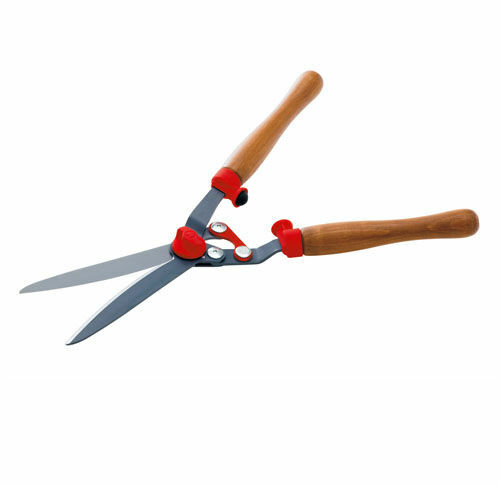 These hedge shears designed by Wolf Garten have loads of features which make them a leading product in the game of short handled hedge shears. Where to begin! The blade designed is specifically manufactured to a design that is curved, double grounded and coated in a non-stick finish resulting in substantially easier cutting. The best feature which is the integrated mechanical levers requires the user to apply 40% less force force when operating the hedge shears! 40% less! Thats a lot of fatigue saving. The individually adjustable blade tension allows you to adjust the tension specifically to suit your needs, ergonomically wooden handles makes them comfortable to hold and the rubber buffers absorb the impact when the shear handles class together. Thats a lot of product for $159! High quality too. Evident in the 10 yr guarantee too.